So I honestly have two noises and I can't decide if they're related. First, I have a clicking noise when the vehicle is rolling and I hit the brakes, then again if I accelerate from a stop. Second, I have developed a popping noise over heavy bumps. Because I live in Michigan, that's basically our entire road system. Both noises are from the right front. In the past year I have changed both ball joints, tie rod ends, front calipers, sway bar links, and the right front strut mount. I have several thoughts. I'm doing front pads and rotors this weekend, the click could be related to loose pads although I would likely have noticed that when I put calipers on. Next, I changed the strut mount 3 months ago thinking it would stop the clicking and since then I developed the pop last month. I'm thinking the monore pos mount is junk. Or, sway bar? It looks ok and I can't find any cracks or anything but the vehicle has 205,000mi on it. Last, maybe all my other thoughts are wrong and the cv joint in the half shaft is toast. Any thoughts are welcome. I'm basically willing to take votes to decide which part to throw at it next. I'd check the ball joints again. I replaced mine earlier this year and the drivers side already went bad. Didn't think they could go bad that quick but they do unfortunately. The popping from the bumps could be a number of things. I know I get a clunking sound over bumps and I think its the hatch struts since they won't hold up the hatch for a long period of time. Could be strut mounts as well. Ah the joys of figuring out noises lol. I bought a set of rendezvous strut assemblies for $40 at a junk yard. They look ok, but far better than my old ones so we will see if it's strut mount noise. Also I have new rotors coming in the mail today. So much cheaper online. I don't think it's the rear hatch, both noises are defiantly from the right front. Although that could explain the creak coming from the back I have been ignoring. I will post again if I fix anything. 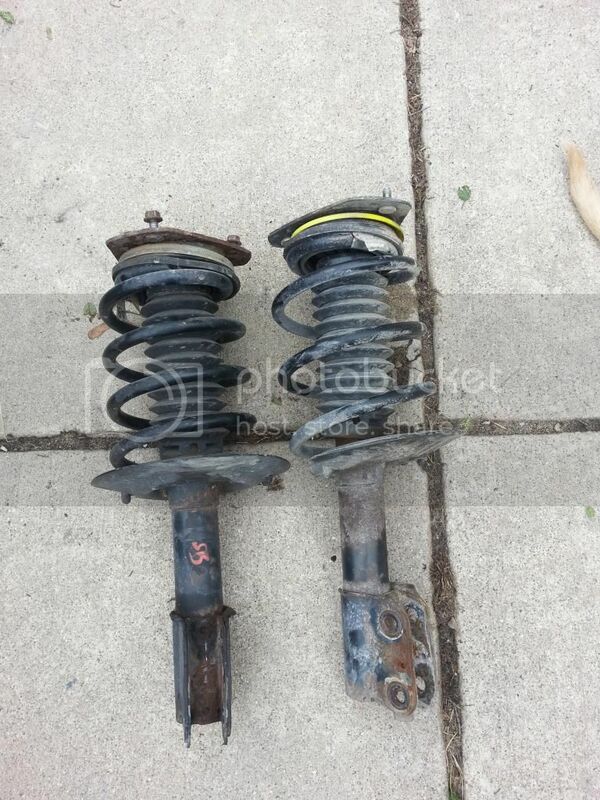 So I went to change my struts yesterday, turns out the rendezvous struts have bigger springs on them. Anyone seen this before? The one I removed is on the right, the rendezvous version is on the left. The popping seems to have been a bad strut mount. Also the aztek rides sooo much smoother now. 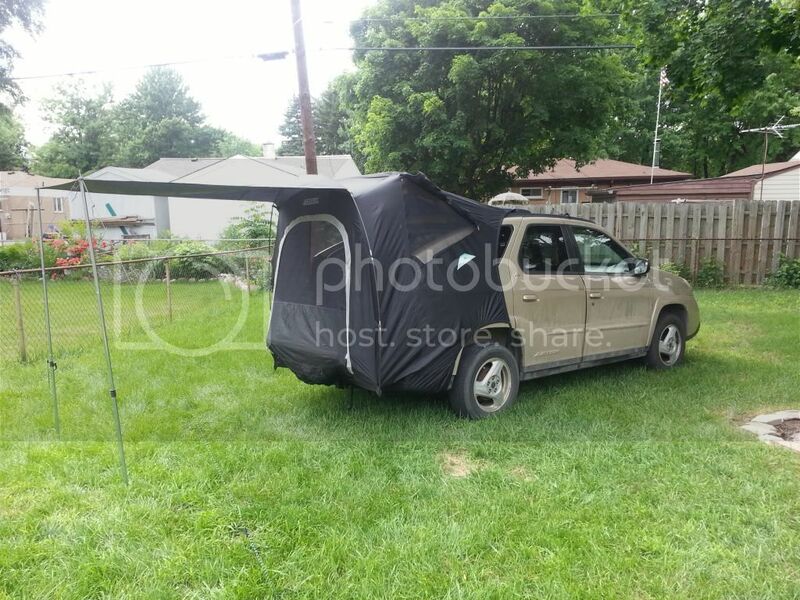 Unrelated, I'm going camping this weekend, thought everyone would want to see the aztek tent in action. The picture is in my backyard, I set it up to clean it. How was camping? Just thought I'd add my .02. I had and indy shop replace struts and strut mounts with monroe mounts and struts were a KYB. The mounts were garbage...the bearing routinely get "stuck" and you would hear the spring pop anytime you turned. They replaced them 3 times before I gave up and took it to the dealer. They used GM parts and haven't had a problem since. But I have a slight "pop" coming from the right front as well that I"ve been chasing for 2 years. Hoping you figured yours out.....one thing I found was loose control arm hardware was making a weird noise. So far, the KYB struts really make the car ride nice. I'm often towing and going over rough road. Nice struts! Found the noise, the ball joint bolts were loose. That being said they were pretty tight but i really tightened them to the point of stretching the bolt and my nose was gone. Hope that helps someone.